Brad Hubeny from Salem State University and Emma Howey from Wellesley College take a sediment core from Sluice Pond in Lynn, Massachusetts. (Inside Science) -- On Nov. 18, 1755, an earthquake estimated at magnitude 6 shook New England so hard that people fled naked and shrieking from their homes, overwhelmed with “Apprehensions of its being the Day of Judgment,” according to one contemporary account. Now, researchers have found a signature of that earthquake buried in the mud of a picturesque body of water in suburban Boston known as Sluice Pond. The discovery, published today in the journal Seismological Research Letters, could be a first step in figuring out how often New Englanders should expect to be rocked by earthquakes in the future. 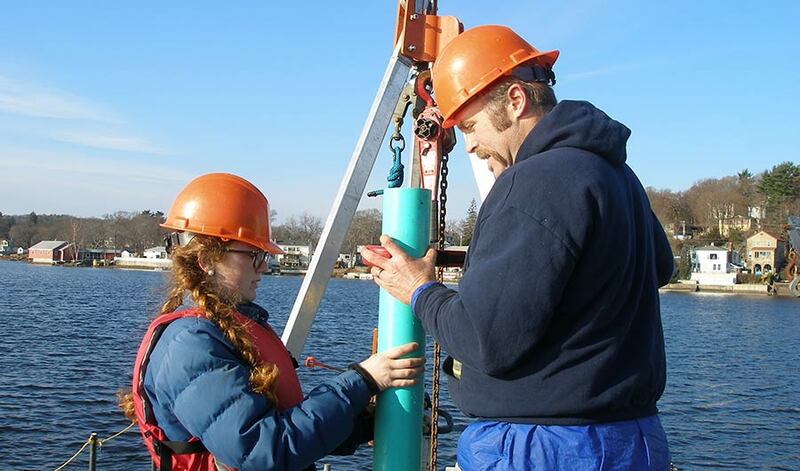 To see what kind of record the event, known as the Cape Ann earthquake, left, researchers from several institutions analyzed sediment cores taken from the pond. To match sediment layers to known historical events, they looked for clues such as pollen particles from wheat introduced by European settlers. Twelve inches down, they found what they were looking for: a layer of pale brown mud laid down sometime between 1740 and 1810. The pale layer had coarse particles at the bottom and fine ones up top, indicating that mud was dumped into the water suddenly and then left to settle. It also contained plant matter typically associated with pond edges, even though the cores were taken from the middle of the pond. The researchers inferred that the pale layer was the residue of landslides on the pond’s steep underwater banks triggered by the Cape Ann earthquake. Large earthquakes are infrequent in New England, but they do happen, said Katrin Monecke, a geologist at Wellesley College in Massachusetts and first author of the study. By looking at deeper, older layers of New England ponds, researchers may be able to detect earthquakes from before recorded history, thus gaining a better sense of the region’s earthquake risk. “By finding out how large [earthquakes] might be and how often they happen, you can actually prepare a little bit better for this hazard,” said Monecke.